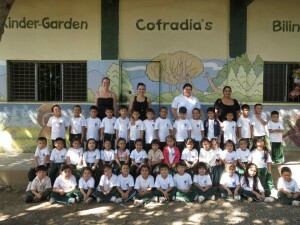 We are a nonprofit bilingual school and have been serving the community of Cofradia since 1997. Cofradia (or “brotherhood”) is both a small town and a reasonably large general area just west of San Pedro Sula in Honduras. CBS actively seeks disadvantaged children in the area and provides them with a quality bilingual education, hence a much brighter future. This year, 2010, we have almost 140 students enrolled and over 1/4 of them are receiving scholarship assistance based on need. Our “Volunteer” teachers, recruited from all over the world, get a chance to live the adventure of a real immersion experience in Central American life and culture while providing a quality Global Education to the students at the school and a culturally broadening experience to the rest of the local community. The international make-up of the team means we always maintain a real multi-cultural perspective in everything we do.